All Souls Day presents us once again with an opportunity to consider the use of black vestments within the Mass. While black is the required liturgical color for All Souls Day and all funerals in the Traditional Latin Mass, it has all but disappeared from the Novus Ordo. White, a color historically associated with baptism and other celebrations, has instead replaced black in most parishes these past forty years. Black signifies mourning, but not simply mourning in general. Rather, black directs us in a particular way to mourn and pray for the dead. While white is a color of festivity and rejoicing, violet is the color which signifies penance and sorrow for sin. However, violet directs us more to mourning for our own sins, and to performing penance for our own wretchedness. Black, on the other hand, helps to direct us to mourn not for ourselves but for the deceased. This is why black is so fitting for the funeral Mass (as well as Requiems and All Souls): The color reminds us to pray for the dead. The funeral Mass is not really about the family – though there are certainly many prayers for the consolation of those who mourn. 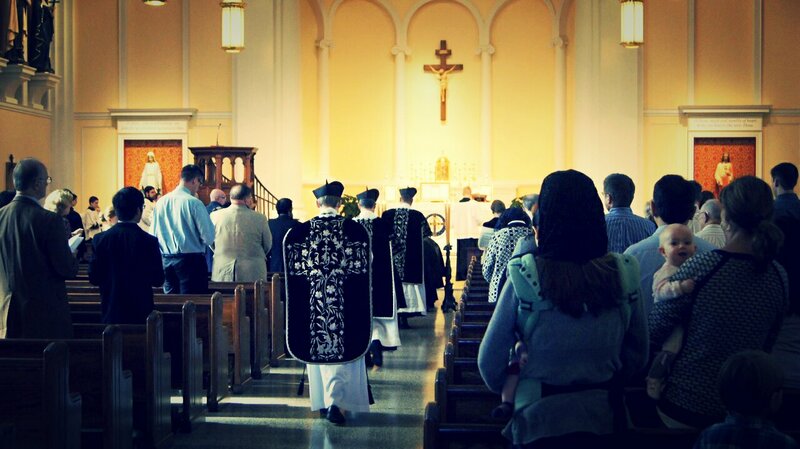 Rather, the funeral Mass is primarily for him who has died: Nearly every prayer is for the forgiveness of his sin (i.e. of the temporal punishment of sin). Funerals are not primarily for the living, they are for the dead – whatever anyone (even if he be a priest) may tell you! This is why it makes no sense – theologically – to wear either white or even purple for a funeral Mass or Requiem. On All Saints’, the priest is directed to wear white vestments because the saints are already in heaven and enjoy the vision of God. They are perfectly happy and have no need of our prayers. All Souls’, however, is the Mass offered for the holy souls in purgatory – it is offered as a prayer in their behalf, for the remission of the temporal punishment they bear for their sins. Now, if the priest wears white vestments on All Souls’ day, can he be the least bit surprised that his faithful have ceased to believe in the reality of purgatory? If the priest wears the color of festivity, rather than the color of prayerful mourning, who will ever believe that there are any souls who suffer purgation after death? As the Traditional Latin Mass requires black vestments for All Souls Day, as well as funeral masses and Requiems, the reemergence of this liturgical color should only increase in the coming years. With many younger priests learning both forms of the Roman Rite, we will slowly begin to see white vestments give way to the traditional black in more and more parishes on All Souls. May this liturgical recovery assist in a greater understanding of Purgatory, and of our need to pray for the souls of the faithful departed. Posted on November 1, 2015, in liturgy and tagged All Souls day, black vestments, Fr. Ryan Erlenbush, latin mass, Requiem masses. Bookmark the permalink. 16 Comments. Why not begin the Mass in Black and after the homily (?) change into white?? And will have happened to make that change? I completely agree on what the loss of the black does to our beliefs. If the priest dresses the same for All Saints Day and All Souls Day, and preaches definitively at funerals how our loved one is in a better place now (Really? How are you so sure? ), how can the faithful help but believe that every one of us ends up in heaven two minutes after we die? I don’t think I have ever seen white at a funeral Mass except for one Mass for two babies who died in utero. I think I would feel scandalized. what do you mean by feeling scandalized?? According to St. Thomas (II-II:43:1) scandal is a word or action evil in itself, which occasions another’s spiritual ruin. I remember Requiem masses celebrated in black vestments and with the catafalque present almost every morning when I was in choir during grade school. I demand the same for my funeral. A few years ago, I provided and insisted that the priest wear black vestments for the funeral of both my mother and father. If not, the funeral director was told that there was to be no funeral Mass. As such, their funerals had to be held at an alternate local church. My family has been made very much aware of my wish that if I can’t have a traditional Requiem High Mass in Latin with black vestments and all the traditional chants, there is to be NO funeral Mass prior to my burial. I don’t want any novus ordo “hocus pocus” over my casket. I’ve rejected such nonsense all my life and don’t want to have anything to do with it when I’m gone. I can’t tolerate the drivel that qualifies as music for the novus ordo mass, and white is simply unacceptable at my funeral. My family and attorney, as well as local funeral directors have been made aware of my wishes and the mandate that if any of these instructions are not followed, services are to be terminated abruptly; and without the interference of clergy, a purely secular burial is to follow immediately. My will also makes these wishes clear. Interesting reading … I’m just missing the mention of Jesus. Thank you for your comment. Our Lord is indeed present throughout the post. Any discussion of the Holy Sacrifice of the Mass, wherein the once for all sacrifice of Calvary is re-presented, is a discussion of Jesus Christ. Masses for the dead are offered so that those who have passed may be released from Purgatory and finally enjoy the beatific vision, spending eternity with Jesus. Carol, He is indeed mentioned in this article. Its all garbage……God must be so amused by the narrow minded and bigoted little people with so little to worry about with what is happening in the world and to mankind! I can’t speak for God, but I know that I’m amused by your ridiculous comment. If you believe that Catholics (“little people”) recovering right worship of God constitutes having “so little to worry about”, you may want to stick around and read a few more blog posts. More reading, less commenting. The Ordinariate permits either black or violet for All Souls Day, but in the two Ordinariate parishes I have been a part of, I have only ever seen black for All Souls, funerals, Requiem Masses and Good Friday. When a love one dies, what pray should be prayed and for how long? Don’t turn off, I am an Anglican/Episcopalian; of what we call the Anglo-Catholic movement. White is not only the colour of Baptism or “festivity”; it is also the colour of Resurrection. Seems like a good colour for Christians at the time of death! Personally I am happy to wear either white (particularly for believers); but also because I have two fine black chasubles…one (a “fiddle-back”) I inherited from an Australian Bush Brother (Anglican Catholics) and so is special to me; and also a Gothic style…made by Alder Hall… the wife of one our dear departed priests!